It’s time for another Room by Room Summer tour. This week we are all sharing our living rooms! 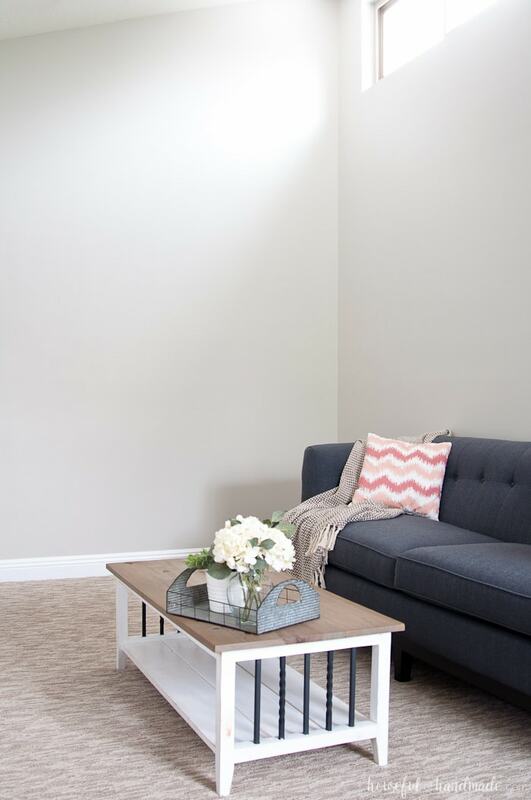 If you have been following along for a while, you may have seen my brand new living room update that we recently finished. I love finally having this beautiful room right inside our front door that we can entertain our guests. 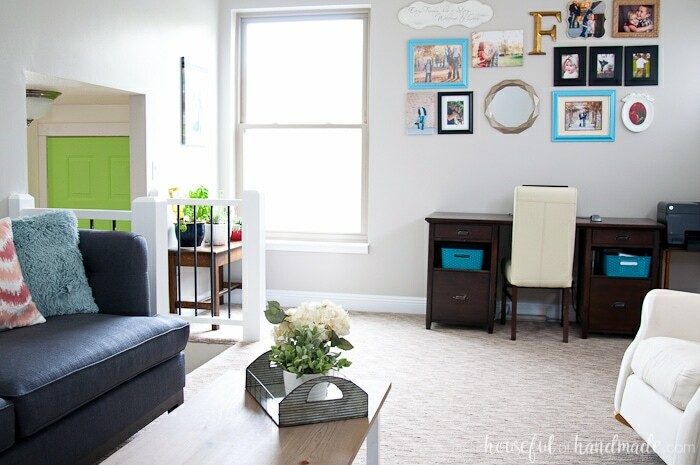 I am excited to share this bright summery living room tour for today’s hop, but I also decided to give you a real life sneak peak of our new basement family room too. I love sharing all the photos from our new living room space. We have been working hard on this room for the last year and a half. Seriously, it has taken us that long to redo the space, but when you compare it to the 8 year master bathroom makeover, it’s like we raced through it! We may not be fast at remodeling around our house, I typically do one project at a time when I have the extra money. 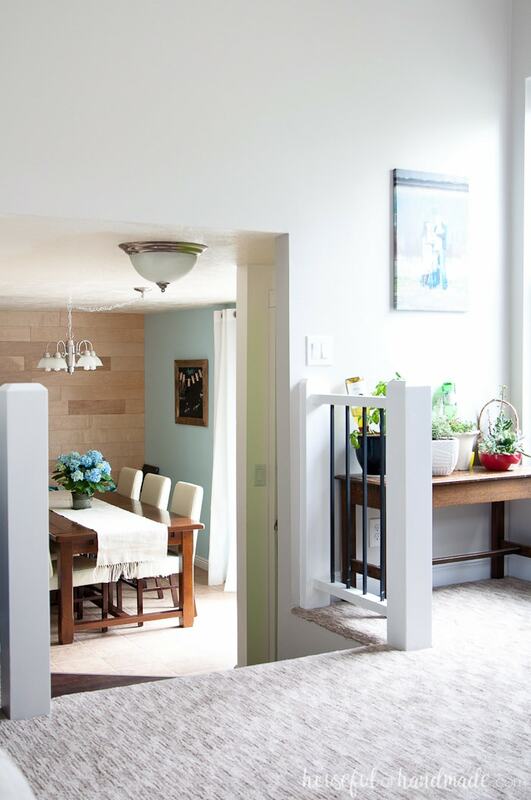 However, we love being able to redo our entire house on a budget. And every space is completed with love. 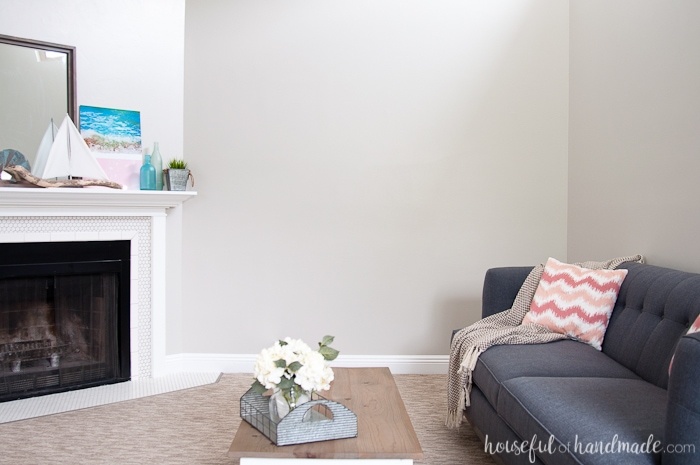 The first project we totally completed in our living room was the fireplace! 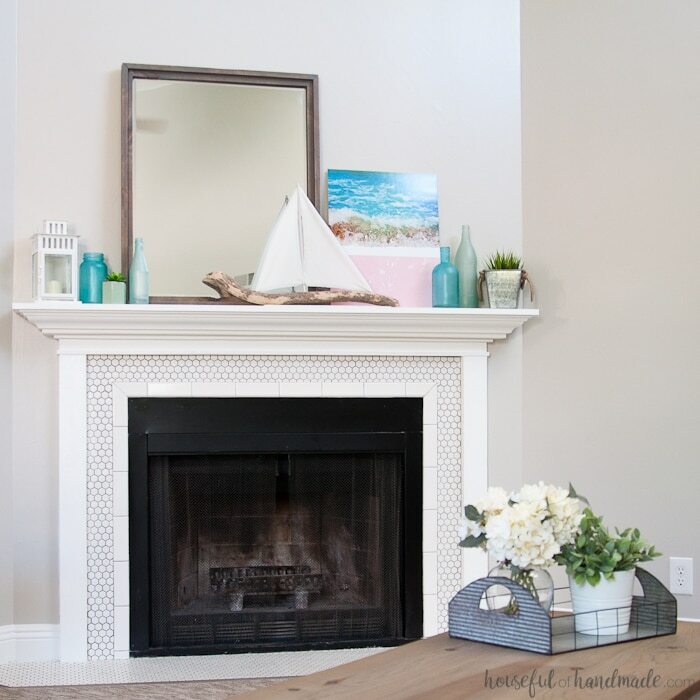 I have always wanted a beautiful fireplace and mantel to decorate for every season. When we bought our home, there was a fireplace, but no mantel. So after living without my much wanted mantel for a few years, I built one! It was there, but not finished for (you guessed it) a few years. You can see my half-finished mantel in this blog post. But when we decided it was finally in the budget to get new carpet (good-bye blue), we had to get serious. I refused to put new carpet in the room until all the projects were done. So last year I tried my hand at tiling and finished our beautiful vintage inspired farmhouse fireplace. It is the perfect focal point of the room and I love decorating it every season, right now it is decked out in all things beachy for summer. The other big project we had to complete for our living room before the carpet could go in was the railings. We had basic 1980s turned railings around the few steps into our living room. They were ugly, so I painted them white. Then the white wore off because I didn’t sand them first (they were turned spindles, I did not want to try to sand those). Since I didn’t like the style I decided redo them! See how we did it here and here. It was the best decision because now I love our railings. After all those projects were done, I decided we needed a fresh coat of the perfect greige paint before the carpet went in. I am so glad we did because I absolutely love the new color (the old gray had too much purple in it) and everything feels clean and fresh. It’s amazing what a new coat of paint can do to a room. To decorate our living room, we have filled it with loads of DIYs (you know I am addicted). 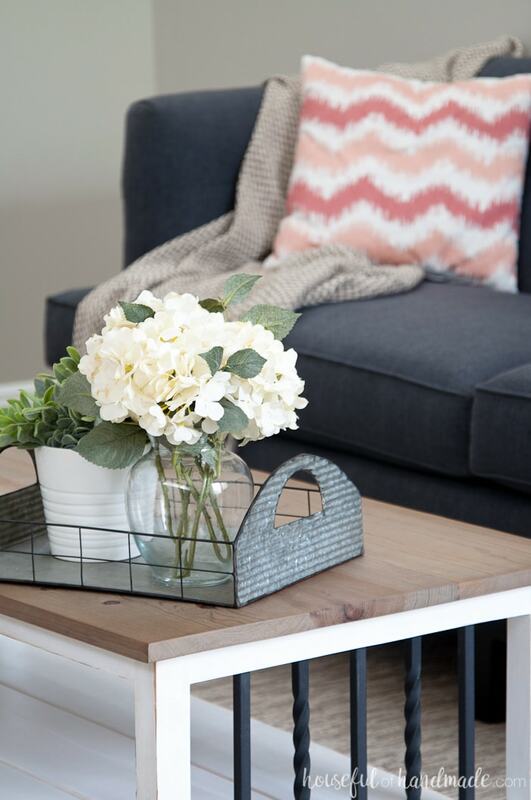 One of my favorites is the farmhouse coffee table. The iron accents coordinate beautifully with the iron balusters of the railing. I also adore the Anthropologie knock-off mirror that was created out of paper! Yep, that beautiful rose gold mirror in our gallery wall is made out of paper. 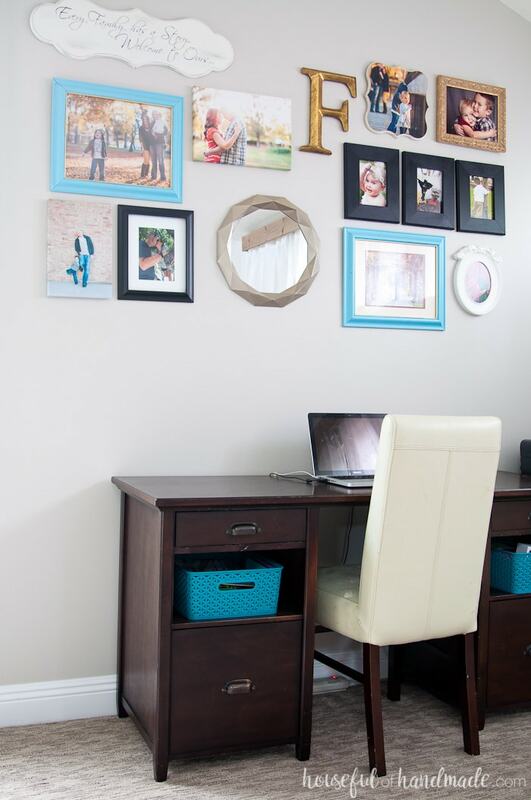 I love it so much I created another on for my new desk space in my craft room. 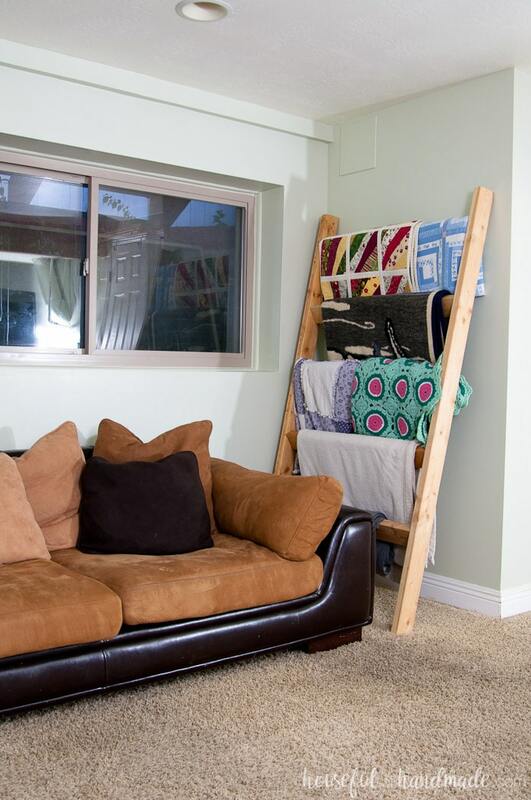 The other big DIY in the room is the curtain valance. I wanted something soft and rustic and just love how it turned out. Writing this post reminds me that I haven’t shared the tutorial for this easy DIY. I’ll add it to the list! We redid the entire basement about 10 years ago and took out the fourth bedroom. We didn’t have kids at the time and wanted a big open area for gathering around the TV. Well, as life has changed so has how we use the space in our home. We did not gather around the TV with friends anymore. Really, the kids were the ones that most used the TV area. So this winter we decided to put the fourth bedroom back in the basement so the kids could both have rooms downstairs. 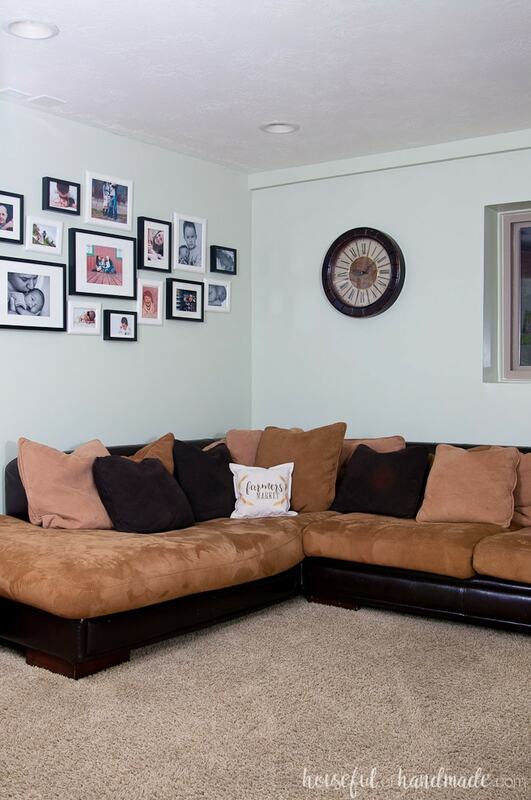 It made the basement family room smaller, but actually it is much better for how our family uses the space. And having both kids downstairs keeps most of the toys in the basement and that makes me happy! This is the first time I am sharing our basement family room. The space still has a long way to go, but gets lots and lots of use. 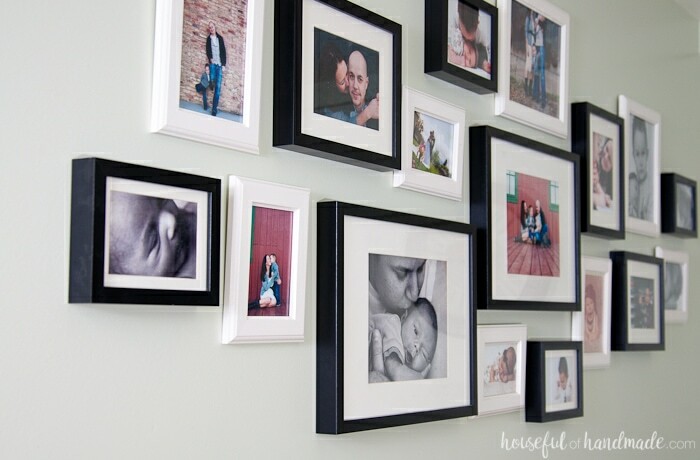 I created a gallery wall over our sofa full of pictures we love of our family. 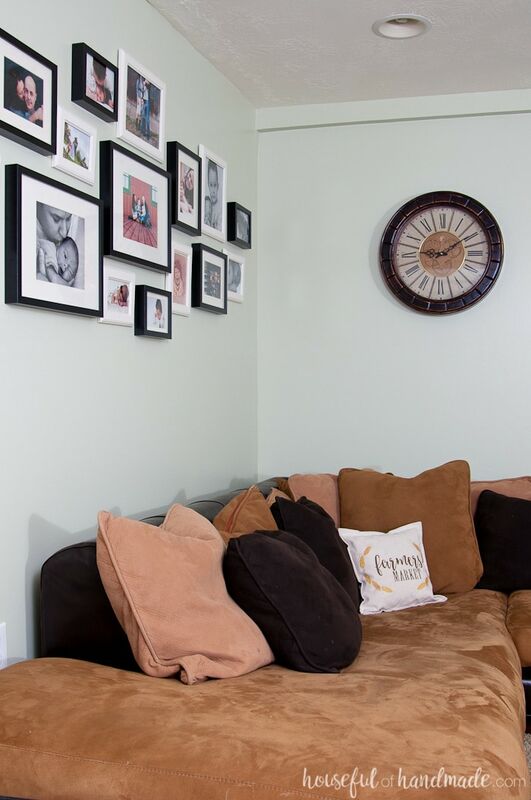 It is the perfect decor for a family room. These photos use to be on some picture shelves over the sofa before we added the fourth bedroom, but the picture ledges kept getting bumped by the kids. So I decided to put them on the wall to hopefully keep them from banging the kids on the head anymore. The other side of the room is our “library” area. Our family is obsessed with books. I can never turn down a fun picture book. And my kids will take a book over so many other toys. This space is usually a pile of books on the ground because the kids cannot figure out how to put them back on the shelves. I still need to do some serious book shelf styling (that is not one of my decorating strengths), but most importantly, this space has to hold all the books! I do have a plan to build a bench between the two bookshelves and get rid of the cheap white bookshelf that we have there now. 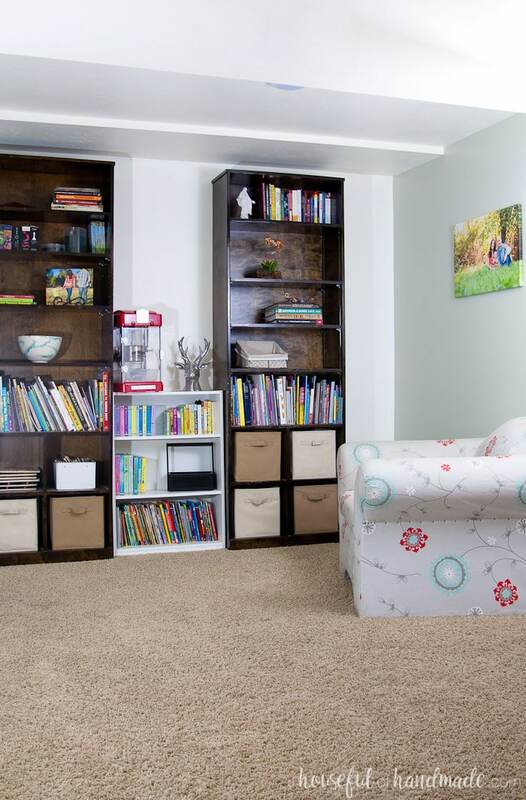 Then it will be the perfect spot for the kids to read for hours. For now, the kids just curl up in the oversized chair I got at the thrift store for $15 over a decade ago. It has been reupholstered a couple times and is still super comfortable. Who would have guessed? There you have it. 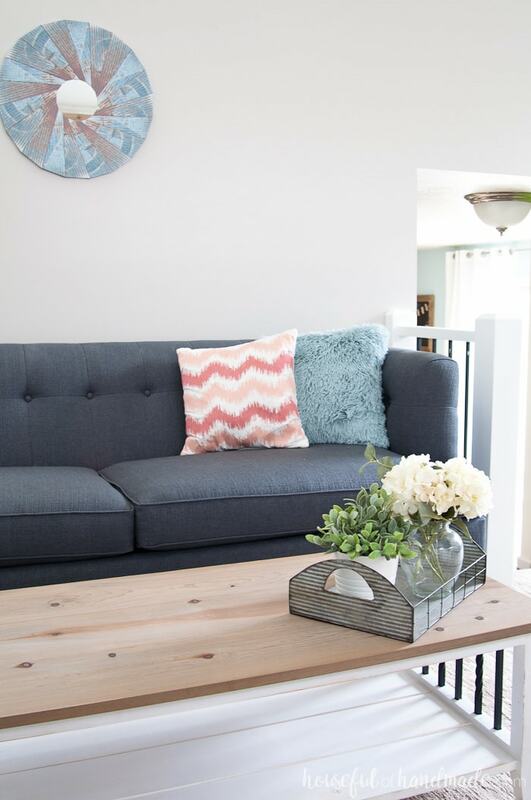 Our summery living room home tour. I love having the beautiful space upstairs to decorate for me and the comfortable space in the basement for the kids to run wild. Now don’t forget to check out the other beautiful spaces everyone else is sharing. What an wonderful space to entertain guest in! So bright and beautiful! 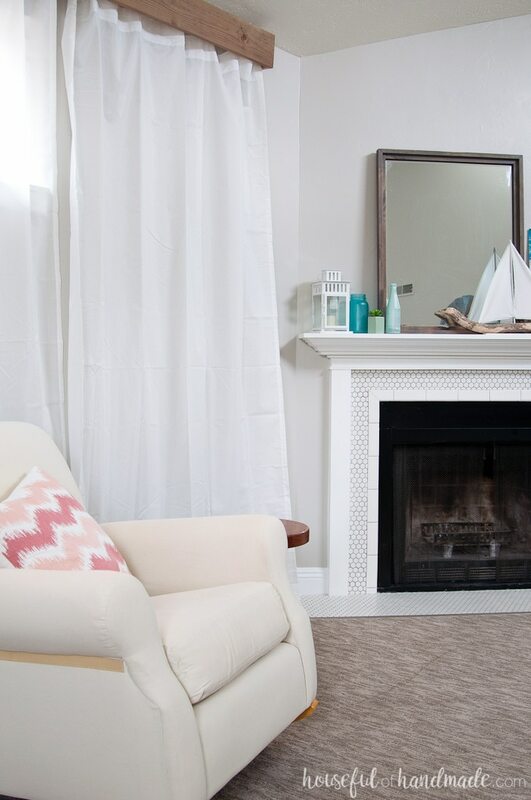 The farmhouse fireplace adds so much to the room! I’m in love! What a relief it must be to have an area of your home finished! Thanks so much Erin. I am definitely relieved to have this room finished, now I can just sit down and enjoy it! I think the wait time definitely paid off in your living room! It looks fantastic – I love the tile you added around the fireplace. 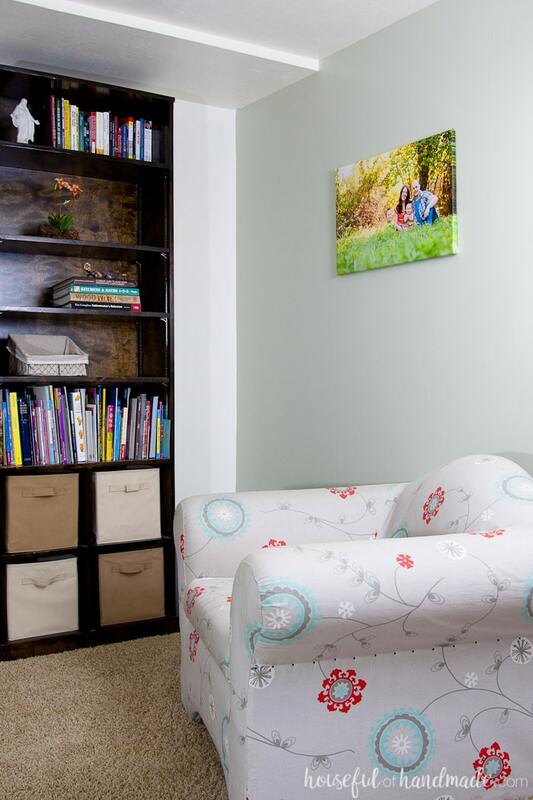 And your basement family room looks like a great space to gather, play and read. I love what you’ve done particularly the curtain valence and that swoon-worthy fireplace. Isn’t it great to have that huge project accomplished? Looks great! 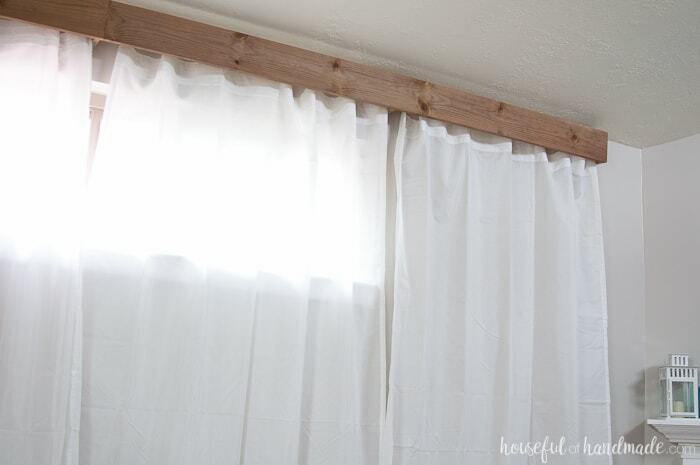 My favorite thing is the stained board valance over the window of beautiful white and bright curtains. My eye went right to that feature. I am wondering how to do that myself, but am not very clever to figure it out ! !